Every fantasy anime falls into many formulaic pitfalls: spells with English names, guys with big swords and even bigger hair, and demon beast resurrections. 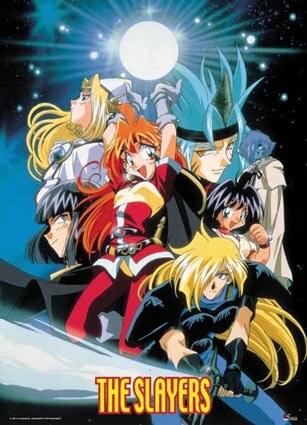 Slayers, the mid-nineties classic anime, has long ago been recognized as the standard for fantasy/action/comedy. There're many good reasons for this. Explaining the plot to Slayers would waste more time than the filler arcs of Naruto. Simply put, Lina Inverse is the young, powerful sorceress who can claim more adversaries than Vash the Stampede. She and her badass (though thick-headed) swordsman companion, Gourry, traverse the land avoiding bandits, robbing from the rich to give to their stomachs, and blowing up everything else in between. Every thirteen episodes, an evil monster is reborn to destroy the world until Lina smashes it. The first season, a convenient boxset sold by FUNimation, can be found pretty cheaply these days, which only adds to the bargain of owning this series. Slayers, though slightly younger than Record of Lodoss War, plays through standard adventures with a barrage of zany characters that grow on you, delivering as many laughs as it does explosions. It features that old school cel animation that your grandpappy remembers, which only contributes to the vintage pacing. One of my favorite situations takes place in a city populated by self-proclaimed "champions of justice." As people charge forward to collect the bounty on Lina's head, she and Gourry take turns keeping track of how many "champions of justice" they blow away in one blow, knocking down adversaries until Lina proves herself not to be the bad guy. Which is like selling pot to your parole officer. What I love about the characters is how stereo-typical they can be while breaking the molds at the same time. Though morality is very clear-cut (good versus evil) anyone who proclaims themselves a force of either ultimately turns out to be false. Initially, the homunculus Zelgadas (eat your heart out, Moonlight Knight) quickly shifts from villain to ally. The Red Priest Rezo is a world-renowned White Mage/Mother Theresa only until he can cure his own blindness. And best of all, Lina and Gourry never claim to be good or evil, just hungry. I'm a sucker for old anime humor and mayhem on a medieval scale. Sometimes the pacing brings the action to a rough halt, especially when Lina explains the intricacies of the three schools of magic, but these scenes are few and far between. Slayers loves nothing more than blowing up the monster and getting to the next one. The voice acting is a very early job, one of Crispin Freeman and Lisa Ortiz's firsts. Just for that, I'm gonna cut them a lot of slack on the mediocre production value. Not the fantasy genre rewriter that Scrapped Princess turned out to be, but a Hellsing of a lot funnier. Grab your friends and dive into Slayers. Okay, so start at episode five, then grab your friends and dive in.